Simple but more robust and reliable than its more sophisticated rivals, the Mosin “three-lined” rifle became a stalwart of the Russo-Japanese war, both world wars and the Russian Civil War, thanks to its practicality on the battlefield. Mention the words ‘Russian’ and ‘weapon’ and the Kalashnikov AK47 assault rifle springs to mind for most people. However, a less-heralded but worthy challenger is the 1891 three-lined Mosin rifle, a stalwart of the Russo-Japanese war, both world wars and the Russian Civil War. So successful was the Mosin rifle that it was modernized four times over half a century while other countries had to update their arsenals with entirely new designs. The three-line, so-called because of the old Russian method of using a set line to measure the bore of a firearm, saw impressive service around the globe. In World War I, captured Mosin rifles were particularly admired by German and Austrian troops for their efficiency and ease of use. The Mosin was then issued to Eastern European armies after World War II before spreading far and wide through the developing world and seeing action again in the wars in Vietnam and Afghanistan in the 1970s and 1980s. Its emergence was a by-product of the times, since in the last decades of the 19th century, dense, rapid and accurate fire became increasingly crucial on the battlefield. Rifles that used black powder to shoot heavy lead bullets were quickly rendered obsolete by lesser-caliber, clip-fed designs. However, attempts to adapt old models failed, heralding the start of another arms race among the leading nations. A breakthrough came in 1886 when France adopted Lt. Col Nicolas Lebel’s 8 mm bolt-action rifle. Using smokeless powder ammunition, it boasted twice the range of any other rifle on the battlefield. Russia immediately purchased a sample batch, took its most successful features and incorporated some significant improvements. Made at the Izhevsk weapons plant, the barrel of the nascent Russian rifle was superior in strength to its French forebear. It had a smaller caliber of three lines, each denoting a width of 0.254 cm, equating to the 7.62mm caliber that was to dominate rifle construction for decades to come. This allowed the rifleman to carry a greater quantity of ammunition compared to those armed with larger-bore foreign models. And in 1890, the chemist Dmitri Mendeleev created Russia’s version of smokeless powder. 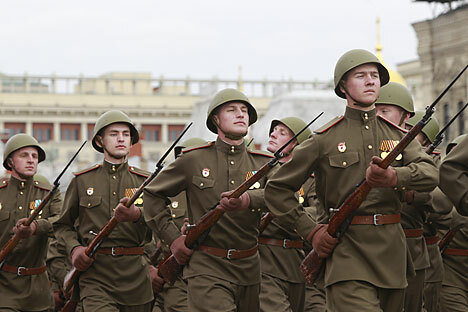 The conditions were in place to launch a new generation of superior Russian rifles, but despite the acceleration of the arms race it was decided to wait. The Russian Army needed a weapon system that was closely compatible with its current arsenals and suited to mass production using existing industrial capacity. Then, in 1891, two designs battled it out in a competition held by the Ministry of War, the rifle of Captain Sergei Mosin and that of Belgian engineer Leon Nagant. They were very different, the Russian rifle being cruder in its construction and intended more as a prototype than an end design. Nagant’s rifle, meanwhile, bore all the finishing touches and was ready for general issue. The sophistication of the Belgian model ultimately worked against it because it was not suitable for the average new recruit with no shooting skills, not to mention its high production costs. And although the three-line looked plain, it quickly showed its robustness, ease of assembly and disassembly and reliability in adverse conditions. Mosin’s design beat out the foreign rival and first saw action in 1893 in a clash between Russian troops and Afghan tribesmen. Three million rifles were in service at the outbreak of the Russo-Japanese War in 1904 and proved their combat value in rough terrain and harsh climatic conditions, despite a shortage of spare parts and poor logistical support. In World War I the Mosins of the Russian troops quickly demonstrated their edge over more intricate British and French models that the Tsarist government had previously bought and tested. But a lack of production facilities forced Russia to sub-contract some manufacture to factories in America, and today a U.S.-built Mosin is a prize item among firearms collectors. The three-line was subject to further improvement between the wars. At the start of World War II the Red Army had been about to switch to the more advanced Tokarev automatic rifle but the Mosin’s simplicity and ease of manufacture ensured its continued place as the foot soldier’s primary weapon. Following a final modification in 1944, production was halted after the war. But millions of units remained in service around the world, some of which are still proudly shouldered as official and ceremonial weapons.